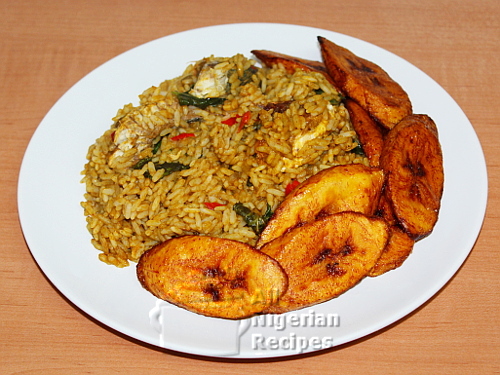 Nigerian Rice Recipes include: Nigerian Rice and Stew, Jollof Rice, Fried Rice, Coconut Rice. 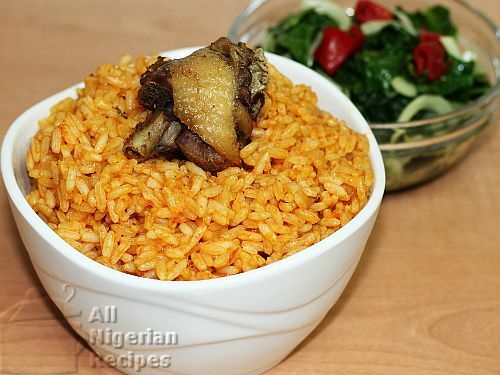 Learn how to cook these popular Nigerian Rice Recipes. 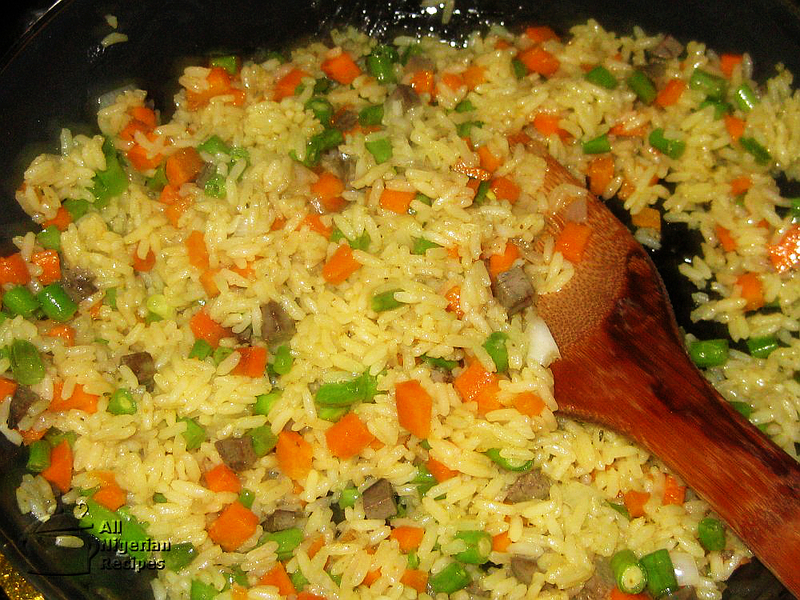 Rice is one of the most common staple foods in Nigeria. 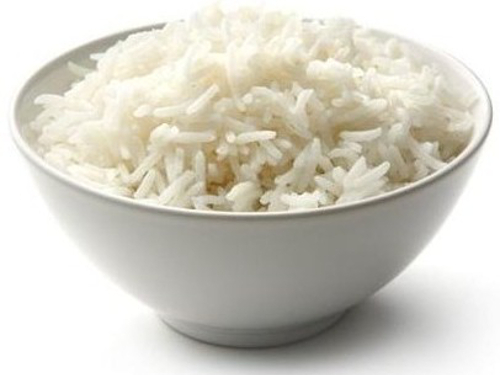 Most families eat a rice dish at least twice a week, either for lunch or for dinner. 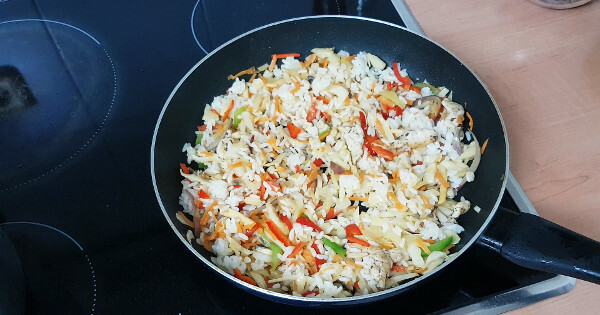 We have two ways of cooking rice in Nigeria: White, served with stew or sauce and Jollof which is where the ingredients are added into and cooked with the rice (one-pot rice recipes). We use the long grain parboiled white rice also known as American rice to cook Nigerian rice recipes especially the rice recipes where the ingredients are added into the rice. If you use any other type of rice with the cooking directions detailed on this site, your Nigerian rice recipes may not turn out well. 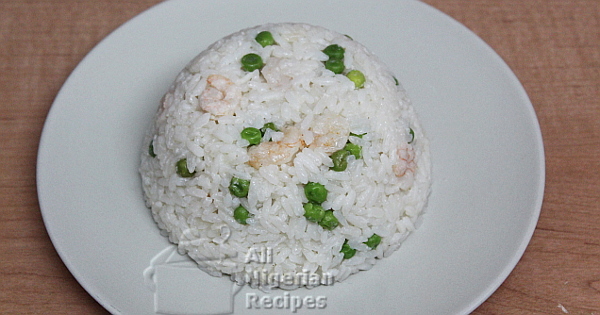 It is OK to use any type of rice when cooking white rice where the sauce or stew is separate from the rice. 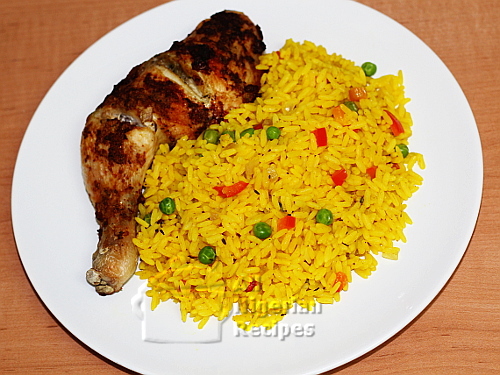 There is a recipe for using basmati rice to prepare jollof rice recipes. Rice can also be boiled and mashed to get a fufu meal that we eat with Nigerian soups. Do you prefer videos? 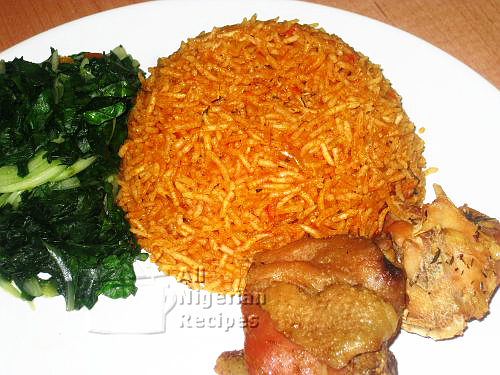 Then watch all the Nigerian rice recipes videos here. 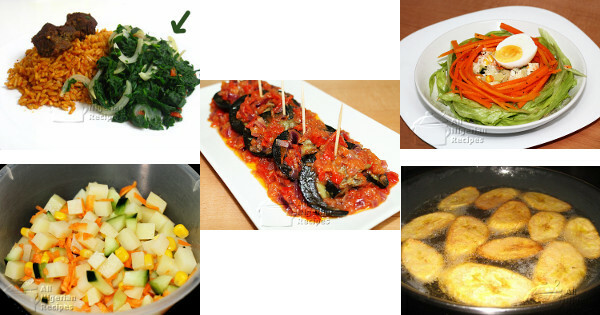 Nigerian Rice accessories are all the side dishes that go well with Nigerian Rice dishes: Moi Moi, Fried Plantains etc. This is a tropical exotic way to enjoy spaghetti. 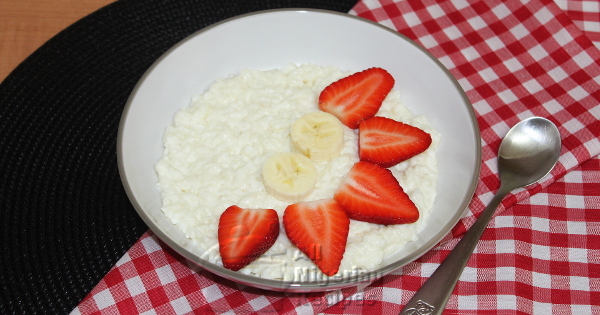 Milky Rice is a great addition to your breakfast meals and a new way to revamp that leftover boiled white rice. 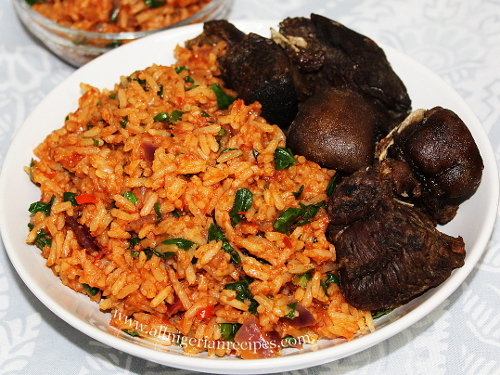 This is a special way to spice up the classic Jollof Rice with leafy vegetables. 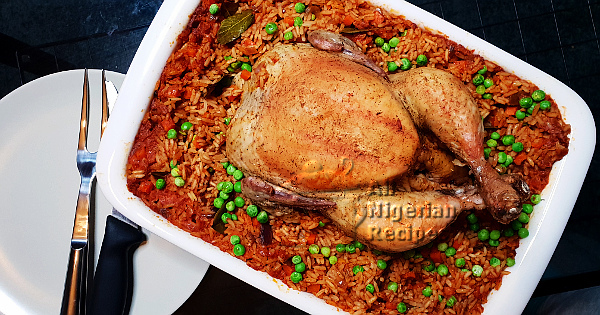 Serve Jollof Rice in a different way during special occasions. One delicious way to revamp your leftover boiled white rice is to fry it with lots of vegetables. It is healthy too! Take your basic boiled white rice from zero to hero with this coconut white rice recipe. 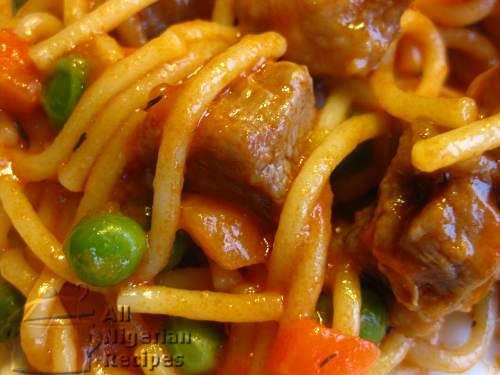 Beef Mince Jollof Rice is the tasty version of Nigerian Jollof Rice prepared with minced beef. A great way to get kids to eat more beef without even knowing it! 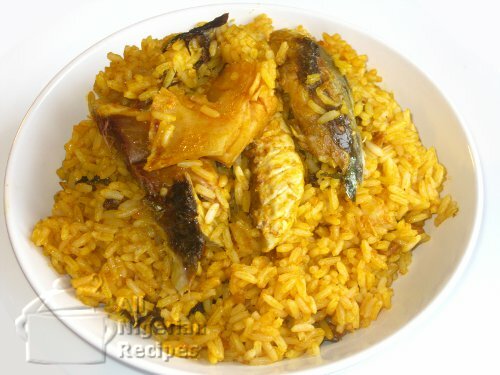 Banga Rice is one of the traditional Nigerian rice recipes, it is prepared with palm fruit concentrate. 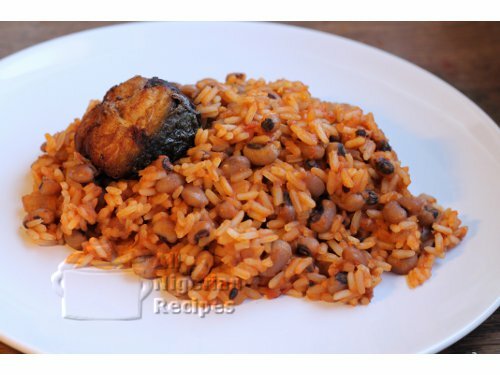 The Nigerian Rice and Stew recipe gives you a wide range of choices. Just cook white rice and eat it with Nigerian Stew, Vegetable Sauce, Pepper Soup or even with something as far-fetched as Egusi Soup! Need a fast, easy and different rice dish to prepare? Turmeric Rice will make a great addition to your family menu! Let’s go tropical with Tropical Fried Rice, the rice recipe you want to prepare when you want to take a break from the classic Fried Rice. 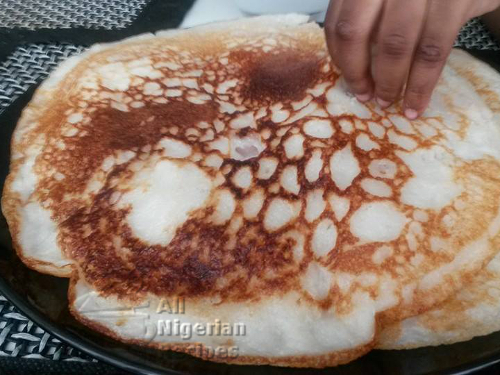 A Northern Nigerian (Hausa) rice delicacy. Serves as a great snack or meal. 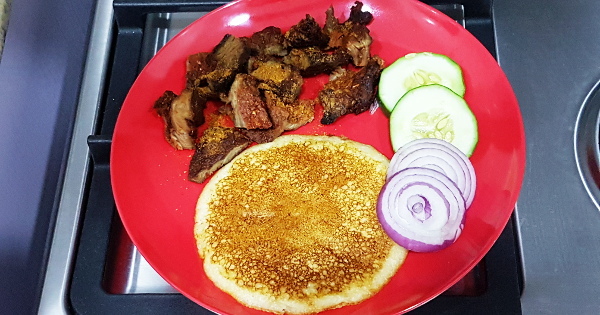 A Northern Nigerian (Hausa) rice delicacy, made even creamier in this latest recipe. Learn how to win at cooking Nigerian Jollof Rice with Basmati rice, Jasmine Rice and other soft rice variety. 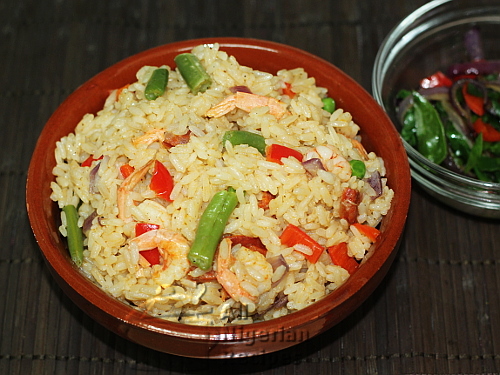 Why not try something different for dinner by adding just 2 well-known vegetables to everyday Jollof Rice? Come and see the wonder ingredient that gives the perfect Smoky Party Jollof Rice without you lighting a single firewood! 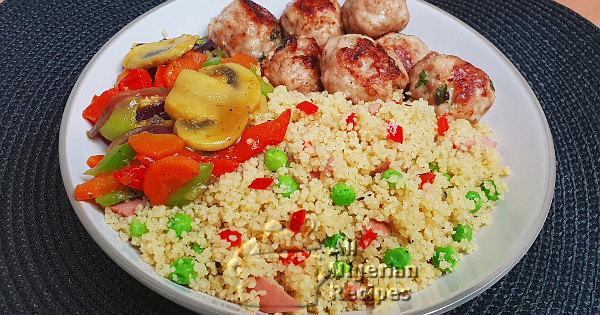 Do you want a delicious way to enjoy couscous? Or you are looking for a new staple to add to your family menu? Click here for the recipe. You can’t mess this rice recipe up because it’s already a concoction! 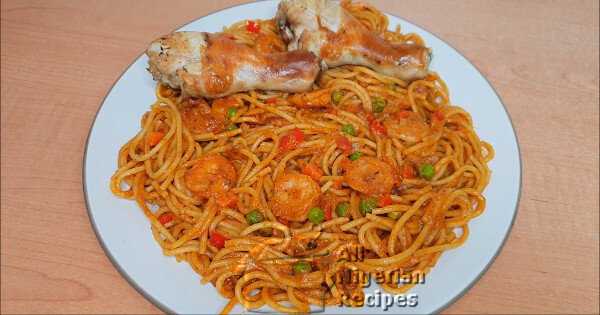 Spaghetti Surprise gives you a whole new way to enjoy this pasta recipe. Click the title and learn how to bring more variety to your dinner table. Not a fan of Beans Porridge? This recipe ensures you do not miss out on the nutritional benefits of eating beans. Which is your favourite? The White Coconut Rice or the Jollof Coconut Rice? 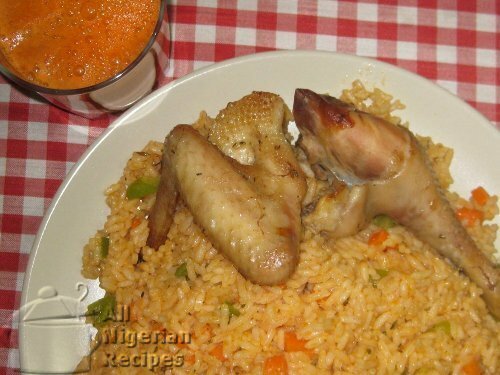 Also known as the Jollof Rice with a twist! Try the coconut rice recipe and find out for yourself. 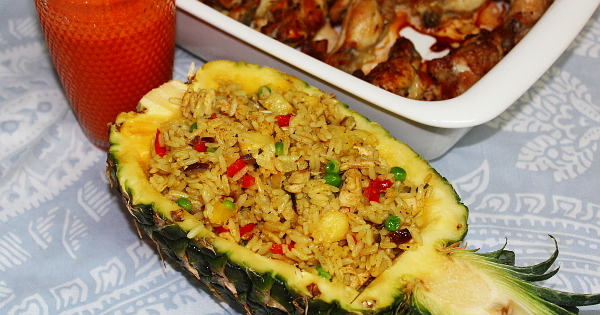 The Nigerian Fried Rice tops the menu at eateries, during special occasions, big parties and events. 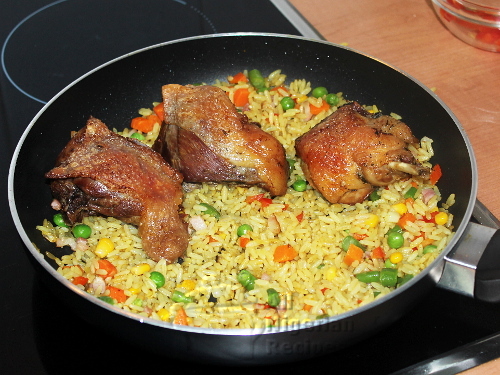 Here’s another way that I prepare Nigerian Fried Rice. 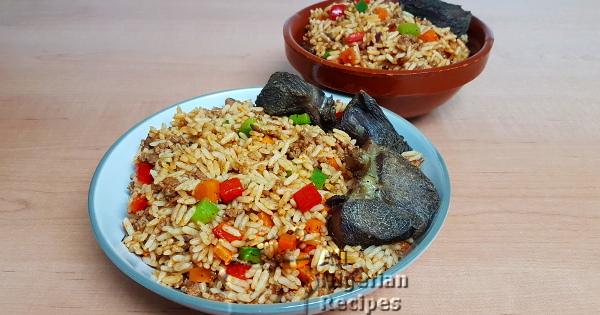 It’s a bit different from the classic Nigerian Fried Rice ingredients and it’s delicious! 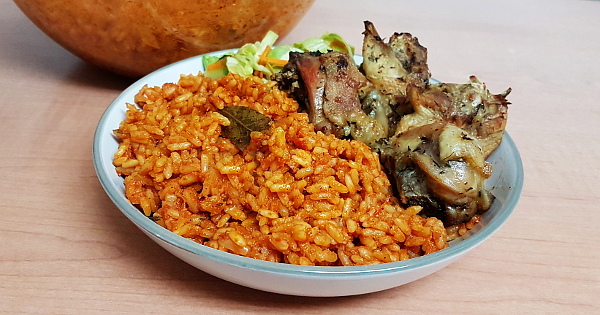 We cannot talk about Nigerian food recipes without mentioning the popular Jollof rice, can we? 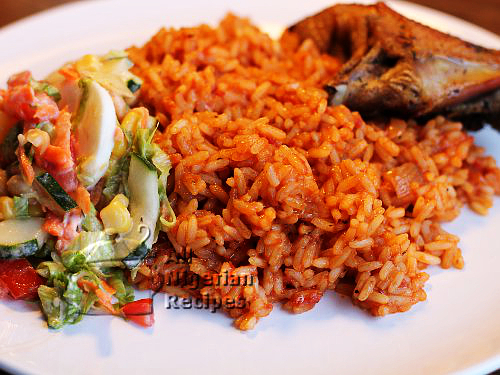 Find out how to make the best Nigerian Jollof rice recipe.